In her many years as a professional nurse and health educator in American Samoa, Longnecker has observed that many local children simply have never been taught some of the most basic health and safety principles. “This can be anything from how scratching sores can escalate to catching a serious illness, to the dangers of getting too close to someone using a weed eater,” she said. For this reason, Longnecker emphasizes the importance of getting these principles across early and frequently to American Samoa’s children by requiring her Family & Child Nursing students to create and carry out their Health Teaching Project. 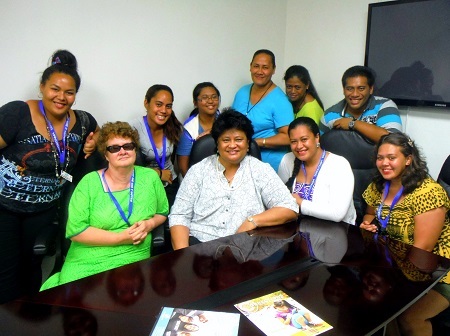 At the Club facility in Tafuna, Longnecker and the Nursing students received a personal greeting and orientation from former First Lady Mrs. Mary Ann Tulafono, who now serves as BGCAS Chairperson and Chief Volunteer Officer. Tulafono explained that the BGCAS is linked to a network of Boys and Girls Clubs nationwide, and how it offers an after-school program mixing fun activities with highly focused academic support for youngsters from at all grade levels, including high school. Another familiar face welcoming the ASCC visitors was BGCAS Executive Director Tupua Roy Fua, remembered by many at the College from his years as Director of the GEAR-UP program. Tupua introduced the ASCC presenters to their audience of more than 30 BGCAS participants aged six through nine. The presentation consisted of two separate “skits” performed by two groups of Nursing students. Using humor and lots of action, the first group of Nursing students acted out how to properly respond to common family emergencies such as choking on food and kitchen fires. Also using live action, props, and music, the second group performed a mini-drama that incorporated village safety, road safety, food safety, animal safety, and ocean safety, all during a simple visit to the park. Having kept their audience engaged, the presenters followed each skits with a quiz on the main safety and health points and prizes for participants who could give the right answers. The youngsters seemed to readily grasp the main points being put across, with several participants even getting up in front of their peers to demonstrate safety procedures they’d witnessed. “Although our skits are entertaining, they’re meant to inform and maybe save a child from injury or death,” reflected Longnecker. In addition to the memory of a fun and informative hour-long session, the ASCC visitors also left the BGCAS youngsters with a number of health and safety brochures to share with their parents. Given the success of the initial ASCC Nursing presentations at the BGCAS, Longnecker said there are plans for additional visits this month. “With the PN students having done so well, the Nursing Department would also like to give our Registered Nursing students a chance to do presentations here, this time target to older participants.” Presentations by the RN students will tie in with the class Mental Health and Psychiatric Nursing (NUR 208). 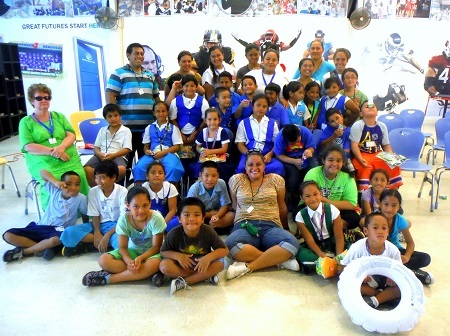 For more information on the Boys and Girls Club of American Samoa, visit their web site at www.bgcas.org.